Attorney General Michael Mukasey was given "a clean bill of health" and hoped to check out of the hospital after extensive medical tests following his collapse, the Justice Department said Friday. Departmental spokeswoman Gina Talamona said that the 67-year-old Mukasey underwent a host of exams after being admitted late Thursday to George Washington University Hospital after he collapsed during a speech at a Washington hotel. "The results are in. Everything looks great," Talamona told reporters gathered outside the hospital in late morning. She reported that that Mukasey had passed a treadmill stress test, a stress echocardiogram, and an MRI. She also said doctors ruled out a stroke or cardiac problem. "He's in good shape," she said, adding that Mukasey hoped to be able to leave the hospital some time later Friday. Talamona said the physicians specifically had ruled out TIA - or transient ischemic attack - which is a mini-stroke. Neither she nor other Mukasey aides would say specifically whether the attorney general would fly home to New York for the weekend or remain in Washington. Talamona said earlier that at no time had Mukasey transferred his authority to his deputy during the period when he was stricken at a dinner of The Federalist Society and during his time in the hospital through the night and into Friday. "There's no indication that he suffered a stroke or any heart-related incident," she said earlier. "It really appears to be a fainting spell." President Bush telephoned the attorney general shortly before 7 a.m. EST to wish him a speedy recovery, press secretary Dana Perino said, describing Mukasey as "sounding well" and saying he was getting "excellent care." Talamona noted that Mukasey had had a very busy day before going to a Washington hotel to give the keynote speech to a black-tie dinner of society, a conservative-oriented legal group. During the talk, he began to slur his words, nodded, turned and started to collapse when he was caught by men standing nearby. His spokeswoman noted that he "works long days. He's very active. It was a late-night speech under hot lights." Mukasey opened his speech on terrorism with a wry remark about expecting the mood at the conservative Federalist Society dinner to be "somber or sober." He slumped over the podium about 15 minutes later after slurring his words and could be seen swaying and shaking slightly. Three or four men in suits rushed on stage and caught him at the lectern. "Oh, no, no!" people in the audience cried out as Mukasey fell. "Oh, my God!" 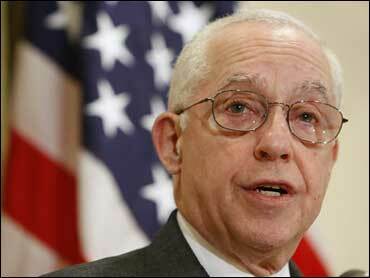 Mukasey, a retired federal judge, is Mr. Bush's third attorney general. The flinty but measured New Yorker has said the job initially discouraged him, and he has scaled back his public appearances in recent weeks. A former prosecutor who saw Mukasey hours earlier described the attorney general as tired-looking and drawn. "The attorney general is conscious, conversant and alert," Carr said after Mukasey was hospitalized. "His vital statistics are strong and he is in good spirits." Talamona said Mukasey's wife, Susan, was with him at the hospital. After collapsing, Mukasey lay on the stage for about 10 minutes being attended to by his FBI security detail and medical personnel at the dinner, said eyewitness Abigail Thernstrom, a senior fellow at the Manhattan Institute. Though he lost consciousness initially, Mukasey appeared to be awake when he was taken from the Marriott Wardman Park Hotel in northwest Washington, she said. "It was hard to watch such a thing," Thernstrom said. "It was horrible." A Republican staffer on the Senate Judiciary Committee, Jack Daly, who was also at the dinner, said in an e-mail to colleagues sent at 10:20 p.m. EST: "AG Mukasey collapsed in the middle of his keynote address at tonight's fed-soc dinner. He is still on stage after ten minutes and his security detail has called 911. The paramedics just arrived." Twenty minutes later, Daly added in another e-mail: "Mukasey did regain consciousness before he was taken away." Mr. Bush, a fierce loyalist, ventured outside his circle of friends and Texas associates to tap Mukasey 14 months ago to replace Alberto Gonzales, who had resigned in disgrace. Gonzales, the president's longtime friend and fellow Texan, quit after months of senators' demands for his resignation and investigations that called his credibility into doubt. In a sun-drenched morning announcement on the White House lawn, Mr. Bush introduced Mukasey as "a tough but fair judge" and asked the Senate to confirm him quickly. Mukasey, the former chief U.S. District Court judge in the Manhattan courthouse just blocks from ground zero, earned a reputation as a tough-on-terrorism jurist with an independent streak. As a judge, Mukasey ordered the detention of young Muslim men as so-called material witnesses in terrorism cases following the Sept. 11 terror attacks. While those decisions drew sharp criticism from immigration lawyers, Mukasey won praise from Bush administration lawyers. Mukasey endorsed much of the USA Patriot Act, which Mr. Bush pushed through Congress following the terror attacks to secure broad new law-enforcement power. And yet he once criticized the Bush administration from the bench for overstepping in a terrorism case. As a jurist, he was known for his brusqueness and impatience with people who waste his time. Before joining the administration, the former judge was a partner at New York-based law firm Patterson Belknap Webb & Tyler.